Making gin has found more and more fans in recent years. However, there is not just the one type of gin. Gin is a spirit flavored with juniper berries (Juniperus communis) or juniper extract and other herbs, although the juniper flavor has to remain predominant. However, in contrast to the famous Slovakian Borovička or the traditional Austrian Kranawitter or Kranewitter, the berries must not be fermented, for example as juniper mash. Agricultural alcohol from grain is normally used for gin. The minimum alcohol content of the finished gin is 37.5% ABV. Gin’s origins go back to the 17th century. At that time jenever was already being produced in the Netherlands, which is also an agricultural alcohol flavored with juniper berries. It quickly became popular in England under the name “gin”, first as an imported product and later from domestic production. 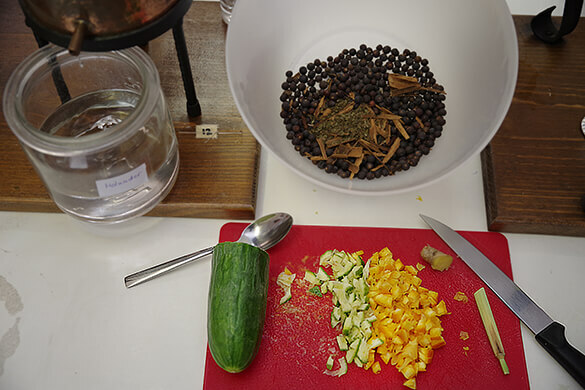 Herbs were also added, whereas Dutch jenever is a pure juniper spirit. The exact composition of the herb mixture is the secret of each gin producer, and is also the reason why each gin ultimately tastes different. Usually coriander, angelica root, violet root (iris root), lemon peel and other herbs are added as well as juniper. For many gin fans, this is the only true method of making gin. Here the juniper berries and herbs, the “botanicals”, are distilled together with the unflavored alcohol. Either the ingredients are marinated, i.e. macerated, for some time in at least 45% ABV and then boiled together, or they are simply put in the vapor space without prior maceration (percolation). The latter method, called vapor extraction or “vapor infusion”, produces a finer flavor than boiling the ingredients together. Afterwards, the distillate is adjusted to drinking strength with water. In addition, with traditional copper stills no unwanted sulfur compounds and fatty acids get into the distillate, which makes the gin milder and more easily digestible. With this method, a large quantity of berries/herbs are distilled with just a small amount of liquid, and the distillate, a concentrate of almost pure essential oil, is mixed with neutral alcohol and water. This method gives commercial producers a major cost advantage, because they no longer have to distil so often to get the same quantity of gin, a comparatively small capacity of the distillation equipment is sufficient, and also the storage costs and risk of the herbs spoiling do not apply. It is true that reasonably good gin can also be produced with this method; however the concentrate also contains many unwanted flavors, for example bitterness, that can emerge after the concentrate has been mixed with alcohol and water. Cold compound is by far the cheapest way to make gin (compound gin). For this, all sorts of artificial or natural flavors, or sometimes also berries and herbs, are simply mixed with alcohol, and that’s it. The gin is often filtered after a certain amount of time to remove clouding or solids. This is the only economical method of mass producing cheap gin. In the second half of the 19th century, the British Parliament enacted strict rules for production in order to stem the sale of illegally distilled gin. The flavor of London Dry Gin is characterized by a strong juniper taste. The addition of non-plant or artificial additives is forbidden, and only up to 0.5 g of sugar can be added per liter. Dry Gin also has an accented note of juniper. The addition of non-plant substances and flavors is allowed, but on the other hand the addition of sugar is not allowed. Just like the two previously mentioned types, distilled gin also has a dominant juniper taste. The difference is that it is distilled a second time after the herbs are macerated or alternatively during the percolation. The neutral alcohol is produced in the first distillation, because for the maceration or percolation the alcohol content in the kettle must be at least 45% ABV. The flavor of distilled gin must no longer be changed after the second distillation. Old Tom is one of the oldest types of gin. Beet sugar was added subsequently to the finished gin, because in the initial phase the gin had a strongly bitter, almost unenjoyable taste. Over the course of time, as the production methods were increasingly improved and refined, it was no longer necessary to sweeten the gin to make it enjoyable, but the tradition of adding sugar was continued because in the meantime consumers had gotten used to the sweet taste. Hence, cordial gin can be regarded as a high-grade Old Tom gin. Bathtub gin is nothing other than compound gin. The term originated in the USA during the prohibition era, when due to the government ban on alcohol at the time, gin was quite often somehow blended in private, or to be more accurate, adulterated. The taste of this variety has very little to do with classical gin. For sloe gin sloes are macerated in distilled gin, as a result of which the alcohol content drops considerably, and sugar is added. In short, sloe gin is nothing other than a sloe liqueur. Reserve Gin is a relatively new development. It is stored in wooden barrels, which also gives it the golden yellow color. New Western Dry is a very young style. Here, the taste of juniper is no longer in the foreground, but completely different flavors. Names such as Plymouth Gin (England), Gin de Mahón (Menorca, Balearic Islands) or Vilnius Gin (Latvia) only relate to the origin of the gin, and not to the taste or the ingredients that are used. It goes without saying that gin will also be made as part of our seminars and courses. If you would like more detailed information in the seminar about production, possible compositions of the botanicals, etc., please mention Gin in the comments when registering for the seminar. Are you looking for distilling equipment or stills for making gin? The Piccolo or Vetro equipment are suitable above all for gin makers who like to experiment. A distillation process takes 20-30 minutes, so you can try many experiments in a short amount of time and with only a small amount of materials. The distillation will yield around 200 ml of gin. If you would like to distil larger quantities of gin, then the Classic or Deluxe still would be the right choice for you.